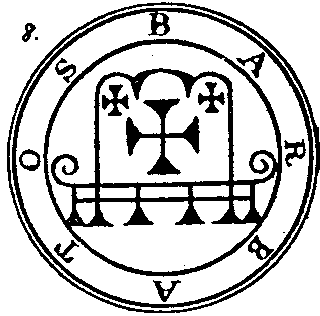 Barbatos, is a great Fomori Lord. He commands 30 legions of his brethren, and when conjured forth often appears with other companion demons. This can make summoning him a dangerous proposition, and is recommended only for those with the knowledge and will to confront and overcome multiple entities if things go awry. Barbatos is prone to using numbers to his advantage. Barbatos appears as a horned archer or hunter, and his arrows always strike true. He is often “bearded”, which his given Latin name suggests. He understands the singing of birds, the barking of dogs, the lowing of bullocks, the voice of all living creatures, and can bestow this gift upon a conjurer. It is said that he can also speak through animals.